POSTED April 4, 2019 4:11 p.m.
For the fifth consecutive year, Platteville Public Schools has been honored with the Best Communities for Music Education designation from The National Association of Music Merchants Foundation for its commitment to music education. In its 20th year, the Best Communities for Music Education designation is awarded to districts that demonstrate outstanding achievement in efforts to provide music access and education to all students. To qualify for the Best Communities designation, PPS answered detailed questions about funding, graduation requirements, music class participation, instruction time, facilities, support for the music programs. Platteville School District music programs are taught by seven certified music educators, and include general music in 4-year-old kindergarten through sixth grade, and elective courses in Choir, Band, Orchestra, Advanced-Placement Music Theory, and Beginning Guitar for grades 5–12. 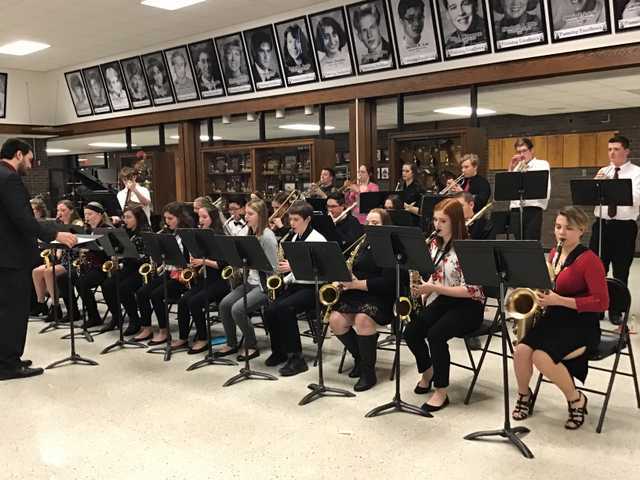 This year’s application focused on innovative music opportunities including a new Digital Audio/Music Production course, Hillmen Jazz Night, Dubuque Symphony Arts Trek, Adopt-a-Musician, and the construction of the Digital Music Learning Lab. The award recognizes school districts leading the way with learning opportunities as outlined in the Every Student Succeeds Act. The legislation guides implementation in the states and replaced the No Child Left Behind Act, which was often criticized for an overemphasis on testing while leaving behind subjects such as music. ESSA recommends music and the arts as important elements of a well-rounded education for all children. A public recognition ceremony will be held in the Platteville High School south gym Monday, June 3 at 5:30 p.m., before PHS music awards night and the annual Pops Concert at 7 p.m.
Other BCME school districts in Wisconsin include Chilton, Delavan–Darien, Elmbrook in Brookfield, Fort Atkinson, Glenwood City, Grafton, Greendale, Hayward, Hortonville, Hudson, Kenosha, Kettle Moraine, Kimberly, Lake Mills, Manitowoc, Oregon, Ripon, Watertown, Wauwatosa, West Allis–West Milwaukee, Whitewater and Williams Bay, along with United Community Center of Milwaukee. Two Wisconsin high schools, Richland Center and Westosha Central in Salem, received the SupportMusic Merit Award.